Four decades after Secretariat’s astounding strength and champion’s heart inspired an entire nation, his name is still revered by new generations, and his achievements continue to capture the imaginations of those who hear his story. Secretariat.com was created as the official online source for this great champion and to honor his legend. Its mission is to celebrate Thoroughbred racing’s past by remembering its heroes; to enhance the awareness of the sport by educating today’s fans and sparking new ones; and to enrich racing’s future by assisting the charities and causes of the Thoroughbred community. Secretariat.com continues to debut an exclusive collection of unique merchandise and collectibles, and serves as the official online source for photography, memorabilia and historical information chronicling the enduring legacy of America’s Horse. 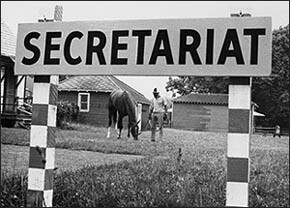 Secretariat.com is also an ongoing source for Thoroughbred-related charitable projects, historical anniversaries and news. Daily Racing Form, Churchill Downs and the Kinetic Corporation, Breeders’ Cup Ltd. and Moonlight Press, Courier Journal Newspaper, TOBA, Time Magazine, and Bill Hahn. We are especially grateful to Penny Chenery for sharing photography and memorabilia from her private archival collection and to Bob Coglianese and the New York Racing Association Photography Department. Selected images are available for purchase.